● Rotatable 90° to drill slant hole. ● Precise graduation, transparent pointer, spacing function. ● Copper plug readjustment to confirm the precision and durable. 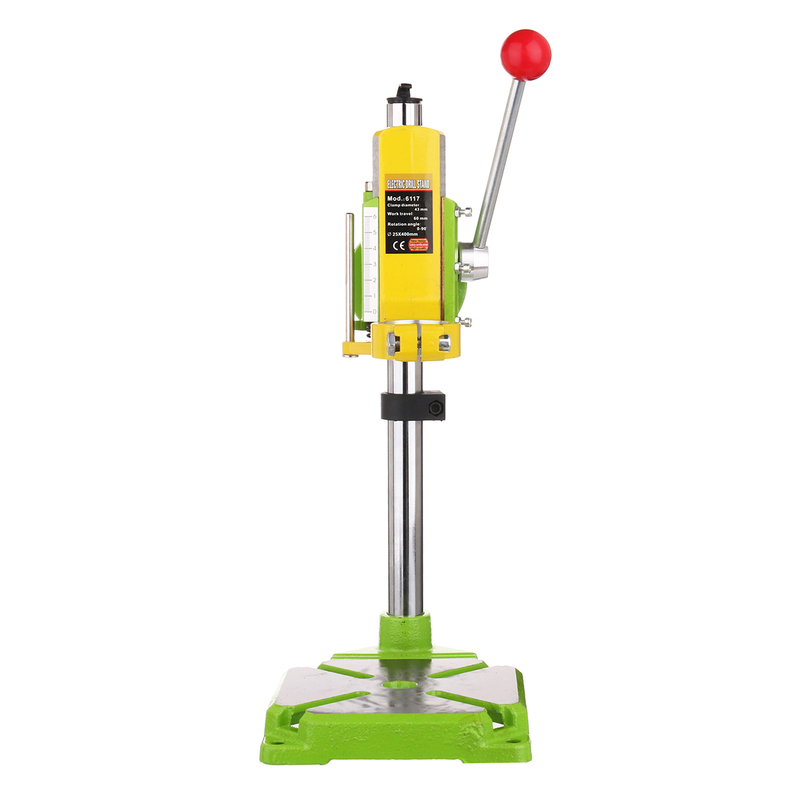 ● This Plunge Drill Stand is ideal for holding your drill or other rotary tool steady during use and allows for much more accurate drilling than hand-held operation. ● It is designed for use with hand-held electric drills with a collar diameterof43 mm or 38 mm, It has a drilling depth up to 60 mm. * You need to manually assembled by yourself. * Electric drill and flat nose pliers are for demonstration, not included in the package. * The jaws specifications 38-43mm, comes with adapter sleeve can take about 38-43mm. Please amount under before making your drill size. * If the drill can be slightly smaller cut yourself some piece of cardboard or rubber mat, if your drill size larger than the jaws (more than 43mm), then do not buy it. * Trial runs machine no loading before any operation. 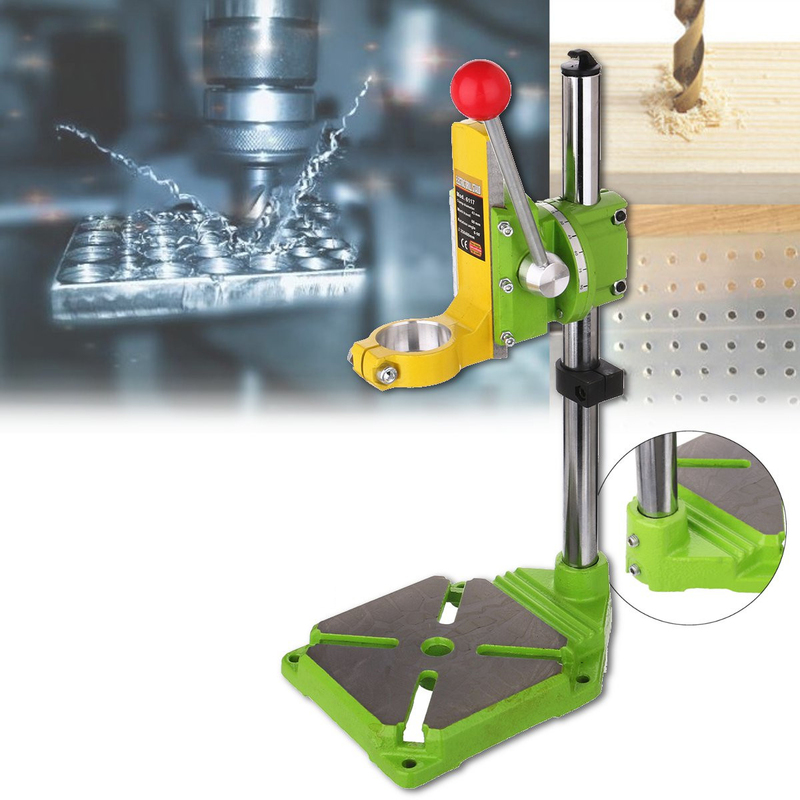 * Use flat vice or other practical way to secure and support the workpiece to a stable platform. !Warning: Before operations, please ensure the machine and the stand all assembly securely and no loosen. !Warning: Please understand and comply to all instructions of dill machine or any other machines application on this stand. – Keep lubricate on slid parts. – Keep your work area clean and well lit. – Dress properly and use safety equipment. – Check the stand carefully before each using. – Keep by-standers, children, and visitors away while operating a machine.